This picture of the spiral galaxy NGC 3621 was taken using the Wide Field Imager at the European Southern Observatory's La Silla Observatory in Chile. An unusual spiral galaxy with a flat, pancake-like shape is missing the trademark central bulge common to other galaxies, a new telescope photo reveals. The bright galaxy, called NGC 3621, appears to be a good example of a classical spiral galaxy at first blush. But astronomers taking a closer look with the European Southern Observatory's La Silla Observatory in Chile discovered that the galaxy is actually rather odd: It does not have a central bulge, making it what scientists call a "pure-disk galaxy." The galaxy's flat shape indicates that it has yet to come face-to-face with another galaxy, since a violent galactic smash-up would disturb the thin disk of stars and create a small bulge at the galaxy's center. Most astronomers think that galaxies grow by merging with other galaxies. Over time, this should create large swells in the centers of spirals. But, recent research has suggested that pure-disk galaxies, like NGC 3621, may be fairly common. The NGC 3621 galaxy is also interesting to astronomers because its relative proximity allows them to study a wide range of astronomical objects within it, including stellar nurseries, dust clouds and pulsating stars called Cepheid variables, which astronomers use as distance markers in the universe. In the late 1990s, NGC 3621 was one of 18 galaxies selected for a project involving NASA's Hubble Space Telescope, which aimed to study Cepheid variables and measure the rate of expansion of the universe to a higher accuracy than had been possible before. From this survey, 69 Cepheid variables were observed in NGC 3621 alone. NGC 3621 is located about 22 million light-years away in the constellation of Hydra (the Sea Snake). It is comparatively bright and can be detected with moderate-size telescopes. This image was taken using the Wide Field Imager on the 2.2-meter telescope at ESO's La Silla Observatory. The data for the image were selected from ESO's archives by Joe DePasquale as part of the organization's Hidden Treasures competition, which invited amateur astronomers to dig through ESO's vast archives and transform raw, gray-scale telescope observations into gorgeous full-color images of space. 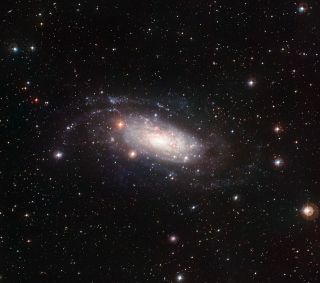 DePasquale's picture of NGC 3621 placed fourth in the competition.